NEW ENGLAND’S APPLE ORCHARDS are about to blossom. After last year’s early bloom — two or three weeks in some places, the result of a mid-April heat wave — this spring will be more typical, with full bloom expected most places over the next seven to ten days. That’s good news for the region’s apple growers, many of whom lost some or all of their 2010 crop due to frost damage last May, when temperatures turned seasonably cool. 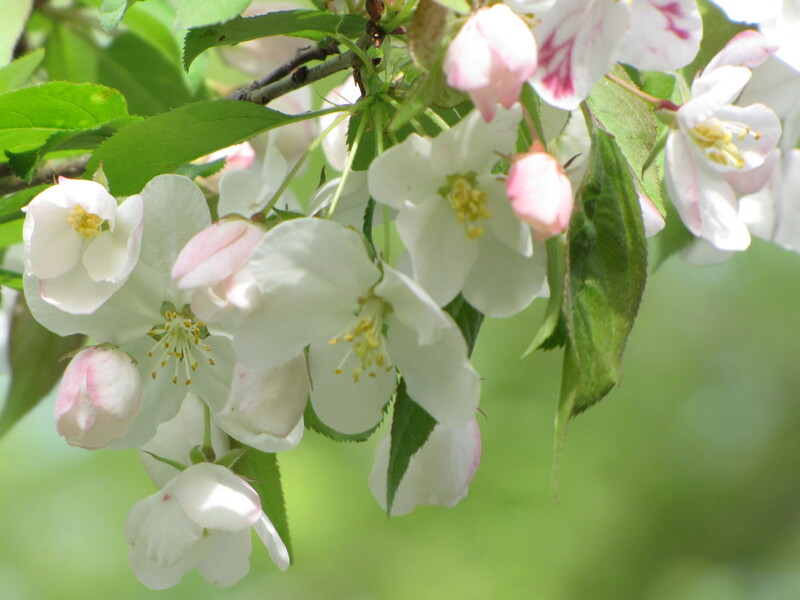 Apple blossoms can withstand a light frost, down to 28 or 29 degrees, but a hard frost will kill them, and that’s exactly what happened in parts of New England last spring. Even in a normal year like this one, growers won’t be able to relax for the next few weeks, until the danger of frost has passed. Traditionally, that date is as late as Memorial Day weekend in northern New England. But the critical factor now that will impact the size and quality of the crop is pollination, without which fruit does not form. Honeybees are on their way to New England orchards at this moment (if they haven’t already arrived), from as far away as Florida and California. Hives are placed in the orchard late at night, when the bees are sluggish, at intervals of about one per acre. The imported bees stay just long enough to pollinate the apple crop, and then they are on their way to some other farm. The itinerant hives supplement the local population of honeybees, bumblebees, and other wild bees to ensure good pollination. Even with plentiful bees, though, the pollination period requires good weather. Without the sun, the bees stay close to their hive rather than visit the blossoms. This happened across the region about a decade ago, when cool, cloudy, or rainy weather persisted for the entire bloom period, with only a smattering of sunshine. The resulting crop was the smallest in years, and it put a number of small orchards, already operating on the thinnest of margins at the time, over the edge. That should not be the case this year, as the ten-day forecast throughout the region shows plenty of sunshine, and the outlook for the apple industry is healthier than it has been for some time. Visit an orchard this weekend to see the bloom in its full splendor. THIS APPLE LEMON CAKE is fast gaining stature as a birthday cake in my circles. Adapted from Olwen Woodier’s classic 1984 Apple Cookbook, this version is rich in flavor and elegant enough to serve at a special occasion. Preheat oven to 350o. Grease and flour a 9×13-inch pan or a 10-inch tube pan. Grate the zest of 1 lemon, reserving 1 t for the glaze. Juice the lemon, reserving 3 T for the glaze. Pour batter in pan. Bake 1 hour 20 minutes. Cool 10 minutes. Prick top of cake with fork tines. TO LEARN MORE about pollination, view this four-minute video program featuring Frank Carlson of Carlson Orchards in Harvard, Massachusetts.